Email your questions and ideas. We’d love to consider them for this section. • I put the paper down and move my fingertips on it, but my marks don’t show up; the paint just covers the paper. Why can’t I see my drawing? • Can you tell me about the toxicity of the paints used in Touch Drawing? • How can I work with colors in Touch Drawing? • How do I become a Touch Drawing Facilitator? • Do I need to be certified as a Touch Drawing Facilitator? • Can I do anything to make the tissue paper drawings stronger? Can I add more color to my Touch Drawings after they are done? • How Can I Economize on Paint? • Are there ways save money on materials for a group? I put the paper down and move my fingertips on it, but my marks don’t show up; the paint just covers the paper. Why can’t I see my drawing? You are probably putting too much paint on the board! This is the single most common problem for people who are trying Touch Drawing on their own. It is a natural impulse to squeeze thick blobs of paint onto the drawing board. It feels great to roll out the squishy paint. Then you put the paper down and the paint is so thick that it soaks into the paper before you touch it. When you touch the paper your movements don’t show because it is already covered with paint! It is best to put small dabs or flat squishes of paint on the board. When you roll it smooth, you should have enough paint to fully cover the board with a thin – not ‘squishy’ – layer. (It is hard to find language for such a tactile experience!) When you put the paper down on the paint, it should require some pressure from your fingertips to make marks on the underside. Of course there is a range of personal taste involved in quantity of paint used. Some people like a wetter look and some like the paint dryer for a finer line quality. Get a feel for the paint quality that appeals to you and GO FOR IT! Can you tell me about the toxicity of the paints used in Touch Drawing? These days more people are concerned about the “toxic fumes” in oil paints. There are two scents associated with oil paints – the paint itself and the solvent used to thin the paint. What you smell in the paints themselves is linseed oil. This is a non-toxic, plant-extracted oil. It has a sweet, organic aroma. It is possible that someone could have an allergy to this oil, but it is not toxic per se. The other familiar scent is turpentine, mineral spirits or other solvent used to thin and clean up after painting. Solvents ARE toxic to breath or touch, to varying degrees. We do NOT use turpentine or other toxic solvents in Touch Drawing. The Center for Touch Drawing uses only AP Approved Non-Toxic Water-Mixable Student Grade Oil Paints. They can be washed off hands, clothes, tables and drawing boards with soap and water. Regular (not water-mixable) student grade oil paints can also be washed off with soap and water. It just takes a little more effort than with the new water-mixable oils. There can also be a concern with toxicity of pigments. Student grade oil paints are made with non-toxic pigments. Expensive artist grade paints have certain colors that are made with toxic pigments like cadmium. This is one reason we always recommend using student grade paints. If someone has an extreme case of chemical sensitivity, there could be a reaction to the paints. Thin rubber gloves could be helpful in this kind of situation. As an extra a precaution, it is always good to use adequate ventilation when working with art materials. A new California law states that art materials that register even a millionth of a part of toxic materials say that they contain toxic materials on the labels. I spoke with the chemists in the factories and they told me that new study techniques allow them to find the most infinitesimal amounts of toxins in the paints. But, according to them, the fact is that facial makeup has more toxic ingredients than student grade paints. But out of concern for liability, many paint companies now have toxic materials labeling on their student grade paints. There is no law that requires that makeup companies disclose the toxicity of their ingredients. How can I work with colors in Touch Drawing? This is a question that comes up in most workshops. 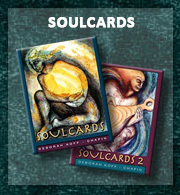 Sometimes people are familiar with the SoulCards, and want to know how to do that. I always encourage them to begin simply in order to establish a deep connection with the process and with themselves. There is no manipulation of color involved in the pure form of Touch Drawing. When I began doing Touch Drawing in 1974, I used standard black printing ink. That‘s what was on the piece of glass on which I did my first Touch Drawings. The issue of color did not even occur to me for years. My focus was on the movement of my fingers on the paper to express the inner movements of my psyche. I highly recommend that you keep paint on the drawing board as simple as possible. Focus your attention on what happens inside of you rather than the colors on the board or the ‘look’ of the drawing. When you begin a session, select a color that appeals to you, that ‘matches your feeling. Put a small amount onto the board, roll it smooth and lay your paper down on top. Then focus your awareness inside and move your fingertips as if they are dancing your feelings onto the page. 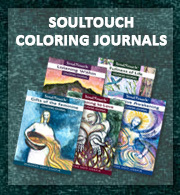 Once you have established your inner connection with Touch Drawing, you can develop your own particular approach to working with more dimensions of color. You might want to have several drawing boards and roll out a different color on each. You can then select a different color board for each drawing, or do your Touch Drawing in layers, moving the paper from one board to another. You can explore applying more than one color to the board. Multiple rollers can help keep the colors from mixing together, but eventually they will roll into one. How do I become a Touch Drawing Facilitator? Touch Drawing is so simple. Roll some paint onto a smooth surface, place a piece of paper on top, move your hands on the page and lift it off to see the completed drawing… How much can it take to teach it? If this was all there was, it would be just another crafty technique. But Touch Drawing is also an interior process; a state of openness to the Self that can take one through emotional transformation and deeper; into communion with the archetypal realm and the divine source. Your consciousness as a presenter influences the depth to which people may go. The abilities to help people feel safe, to hold a sacred space and to support authentic communication are essential. On the other end of the spectrum, technical details are really important. For example, how much paper do you need so everyone can do as many drawings as they wish? If a technical detail is off, a potentially vibrant creative experience may become a frustrating or superficial one. You must first establish and deepen your own relationship with the process so you can introduce it to others from an authentic place. You might find it helpful to invite one or two friends to join you in drawing regularly. Each individual comes to Touch Drawing with unique skills and gifts. I encourage you to approach facilitating from the fullness of who YOU are. 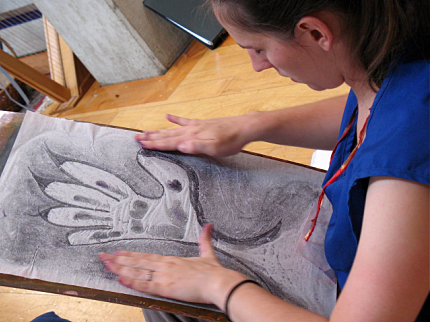 Touch Drawing can be integrated into a broad range of therapeutic, healing, educational, creative, or spiritual settings. It is important to customize the presentation of the process to the specific situation you are in. I recommend that you begin sharing Touch Drawing with friends and colleagues in small groups before doing anything public. Ask them for honest feedback on your presentation and their experience, and fine-tune your particular approach accordingly. 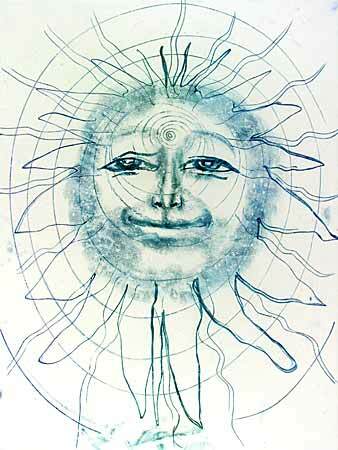 I highly recommend that you attend the Annual Touch Drawing Gathering on Whidbey Island, Washington. It provides a deep initiation into the spirit of Touch Drawing in the company of kindred souls. 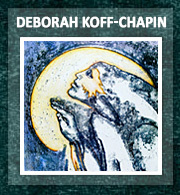 The Gathering generates a heart-centered community spirit for people who have a passion for Touch Drawing. The other resource I offer is the The Touch Drawing Facilitator Workbook. It includes everything I can think of from over 30 years of introducing Touch Drawing; details about acquiring, setting up and handling the materials, ideas on holding the space for people while they draw, as well as many variations on the process and ways to integrate the images. 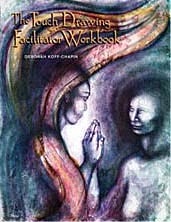 The Workbook also includes offerings by a number of other facilitators, to give a range of ideas and perspectives. Once you have purchased the Workbook, you are entered into a special category in our database, so I can be in closer contact with you. I request that you give the website to people with whom you share Touch Drawing. We would appreciate if you purchase materials from us, and encourage others to do so as well. We keep our prices competitive with the best online art supply websites. Sale of products keeps the Center for Touch Drawing office afloat, And let me know what you are doing! What settings are you presenting it in? How are you integrating Touch Drawing with other processes? Reports of personal experiences and ways of teaching provide vital source material for media presentations about the process. I invite you to expand the garden of Touch Drawing by planting the seeds of this dynamic creative process in your own unique life. I cannot cultivate all the possible uses of Touch Drawing by myself! Do I need to be certified as a Touch Drawing Facilitator? As of this time, there is no formal certification required to be a Touch Drawing facilitator. The flip side of this open approach is that you cannot say that you are trained or certified as a facilitator. I do not feel it is appropriate for me to take responsibility for how someone else presents this process to others, especially when I have no way of knowing the quality of their facilitation skills. You come to the facilitation of Touch Drawing with your own gifts and abilities People will want to work with you based on who you are, your specific area of expertise and your reputation within your community. 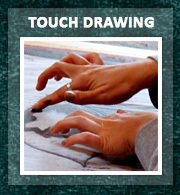 If you have studied the The Touch Drawing Facilitator Workbook and followed the progression I suggest whereby you do it yourself and share the process privately with friends or colleagues before putting it out to the public, it is fine to refer to yourself as a facilitator of Touch Drawing. If you have taken a workshop with me, or attended the Touch Drawing Gathering, you can certainly share that. Though not a Facilitator Training in the usual sense, The Gathering is the deepest experience of Touch Drawing that I offer. It provides a foundation upon which you can develop your own way of sharing the process with others. Right now i encourage you to join the Facebook Touch Drawing Group. I am currently exploring the possibility of a more targeted, private social media platform for Touch Drawing Facilitators. This approach could offer a good middle-way. It would provide a context in which you could network with others and make your own contribution to Touch Drawing on an organizational level. Please contact me if you have interest in helping to make this a reality. Can I do anything to make the tissue paper drawings stronger? Can I add more color to my Touch Drawings after they are done? It can be very fulfilling to bring your raw, spontaneous images into a more fully actualized form. Although the tissue paper that I recommend for Touch Drawing is delicate and translucent, there are ways you can strengthen it. If you like the translucent quality of a drawing, you can get it laminated at a copy shop. Tissue paper can also be mounted on a heavier surface like poster board, railroad board, foam core, mat board or canvas. This makes the image much brighter, firmer and longer lasting. Once mounted, it becomes a strong surface on which to embellish your drawing with color. 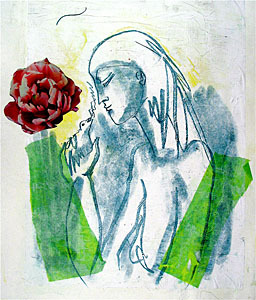 Take care in selecting which drawings to enhance with extra color. A favorite drawing that has a sense of completeness may not be improved by the addition of color. The mounting itself will give it more contrast and presence and may be all that is needed. Then again, an image that does not seem quite complete offers you room to play with color. A ‘ho-hum’ image may just come alive with the right touches of color. It is better to wait at least a day for the drawings to dry before mounting or coloring them. If you want to mount one while it is still wet, you can do so if you place it on the mounting surface wet side down. The drawing will show almost as well as if it was mounted paint-side up. There are two ways to mount the paper. One is to use spray glue. Be sure to do this in a very well ventilated place. This material is very toxic. The other approach is to use clear acrylic paint medium or Modge Podge, a montage glue. With a large paintbrush or sponge brush, cover the surface of the mounting board with the medium. Then gently lay the drawing on top of the wet surface. It is easier if you have someone to help you stretch it evenly out and lay it flat. Put a clean sheet of tissue paper on top of the drawing to protect it while you rub gently from the center out. This adheres the paper to the board and pushes out air bubbles. Then take the clean sheet off. When the clear medium has dried, color can easily be added to the surface with pastels, chalks, markers, oil pastels, colored tissue paper, acrylics or oil paints. You could even put some color under the drawing before you mount it. This will glow through the paper from behind after the medium has made the tissue more transparent. Or cut out images from other sources and montage into your drawing. If you would like a glossier finish, you can gently brush another layer of medium over the surface of the drawing when you have completed coloring it. If you use a large mounting board, two drawings can be mounted side by side, or several drawings can be cut and montaged into one larger image. If you use a lightweight railroad or poster board, you can cut into different shapes. For instance, a face can be mounted and cut to form a wearable mask. There is no limit to the creative variations you can explore with coloring and mounting. Think of it as your own cosmic coloring book! How can I economize on paint? 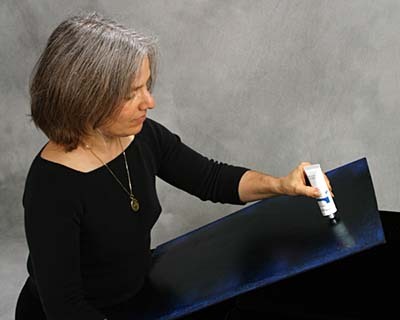 • Squeeze less paint from the tube when you roll out the board. If you are facilitating, always remind your participants that they do not need to make their drawing board ‘goopy’ with paint – they just need enough on the board to make a smooth, thin layer of paint. • You do not have to add paint to the board very often. Just roll out the board and do another drawing. Do not add paint until you feel the drawing is getting too light for your liking. This will also protect against deep indentations forming in the paint from previous drawings. These happen when you keep adding paint so often that you have a deep wet surface of paint that ends up getting incised with drawings. They are very difficult to roll out. If you use water mixable paints, you can try sprinkling a small amount of water onto the board to soften the paint. Then roll out the indentations. If they don’t come out, just wash off the board and start again. • Use larger tubes. Though larger tubes cost more initially, you pay much less per ounce of paint. • Keep the color simple. You can have one tube per table. if you want to have a selection of colors, put several tubes on a central table. Participants can dab their choice on their board and return it to the central table. • Look on the internet for water mixable oil paints. You can find some unbeatable prices on the discount art supply sites. The Center for Touch Drawing sells paint below retail price, but we cannot compete with the giant art web sites. When you purchase through us, you support our work and we are very grateful for that. But it is more important to us that you DO TOUCH DRAWING, so look for bargains if that helps. 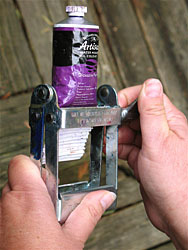 • Use a paint tube squeezer or crimper to get much more paint out of each tube. I recommend you get a metal one rather than plastic, especially if you use large tubes of paint. I like to go through all my tubes before a workshop, squeezing the paint toward the front of each tube and rolling the crimped part of the tube up. I even wipe the tubes off with a soapy sponge so they stay looking fresh. This is especially important with the new super-large tubes that will last for multiple workshops. If you don’t have a crimper, you can use a large spoon to press from the bottom of the tube. If a tube develops a leak, wrap that area with duct tape to prevent messy leaks. I want to do Touch Drawing with a group, but don’t have much money to purchase art supplies. Are there any ways to save on materials? • There are many ways to economize on paint. Read the FAQ just above this one “How to Economize on Paint” for in-depth suggestions on this subject. • One roller can be shared by 2-4 people if they share a table. This is easiest when you don’t have a lot of different colors. 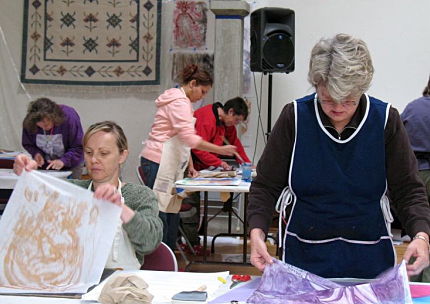 • Instead of having drawing boards, participants can roll paint directly onto formica or other smooth tabletops. Then wash off the tables when done. It is best to use water mixable oils so you can wash the tables easily. • Carpenters or cabinet makers often have scrap formica (the generic name is plastic laminate) or other smooth surfaced boards that they might give you for free. It can save them dump fees and it’s ecological. • Wrapping tissue in bulk packages is the least expensive paper you can buy and works wonderfully. It is available at paper supply stores or by mail order through us. But any paper will work for Touch Drawing. You might find a printer that is willing to give you paper that is leftover from printing jobs. Or check your local recycling center. They might have usable paper that has been brought for recycling. You never know where else you might find a stack of paper that no one wants. It could be interesting to do Touch Drawing on already printed paper like newspaper and incorporate the printed images and words into your drawing. • Take turns using the Touch Drawing materials. Set up an area in your meeting space with enough materials for a small group to do Touch Drawing. Set up other areas for additional creative processes like writing, movement or another visual art exercise. Divide participants into small groups. Introduce everyone to Touch Drawing and the other creative practices. Each group begins in one of the areas. After an appropriate amount of time, ring a bell or otherwise let them know it is time for their group to shift to the next activity. Keep the small groups rotating until everyone has experienced each art form. This can be a very rich ‘multi-modal expressive arts’ experience, where one art form enhances and deepens the other. As the facilitator, you hold the sacred space for all the groups simultaneously. It might be helpful to have more facilitators for this type of experience; one for each art form would be wonderful. • If you have only one set of Touch Drawing materials and a small group who would like to experience it, give each person a few minutes to draw, while the rest of the group holds space for them. The group might meditate silently or drum or tone in support of each person while they draw. The support of the group for each individual could be a very powerful experience. • You could also explore what it is like for two people to work on one drawing. This can be an interesting exploration of relationship.